Summary: Wedding invitation cards are always the first impression to your guests. As someone says, "First Impression is The Last Impression", it is very important to have an eye-catching wedding invite in order to create excitement and freshness in the guest's mind. Unlike traditional wedding invite, AmoLink here can help you make a dynamic and innovative card that will deeply impress others! So your wedding day is coming, you are busy with preparing all about your wedding ceremony. But first you should choose a wedding invitation to let the all world know your big day. For all couples who want a truly unique look for their wedding, the invitations are really a wonderful place to start. As we know, with the development of digital cards, the custom options available for wedding invitations are unlimited online. You can have many ways to create exquisite and unique invitations of your special day. It’s your decision time to select or design a wedding invite that will be one of the most lasting mementos at that big day. To make wedding invitations reflect the true spirit that you want to show, AmoLink operates a new modern way to help designers. You can now create a dynamic wedding invite without worrying about whether it presents a traditional look. Fun and quirky? Sophisticated or relaxed? Magical, formal, or cozy? 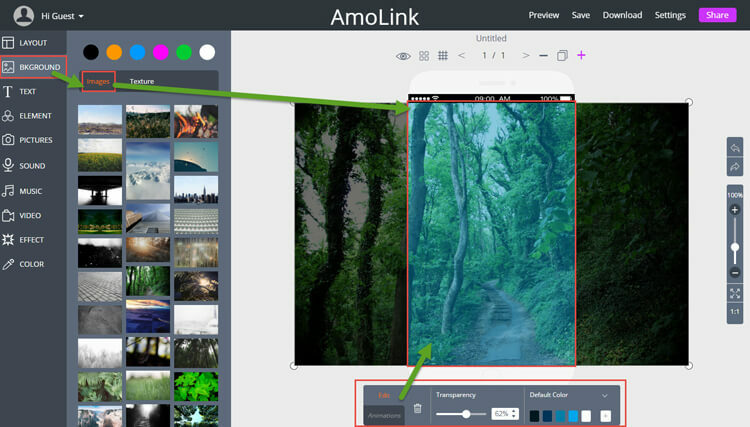 With huge collection of stock photos, images, layouts, sound, music, video and other effects, let our AmoLink tool be your design inspiration! All your styles of wedding invitation cards can be made out through AmoLink platform. 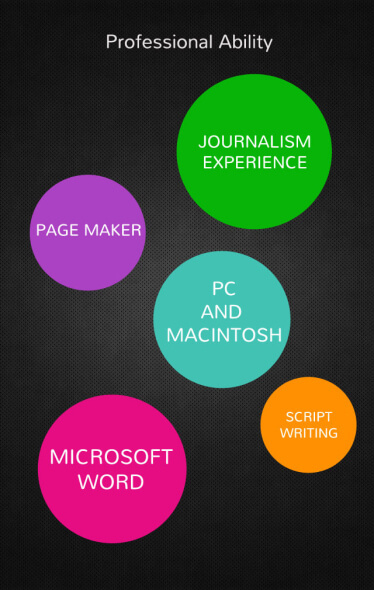 What’s more, no complicated skills are needed! Open AmoLink and select a layout you prefer. 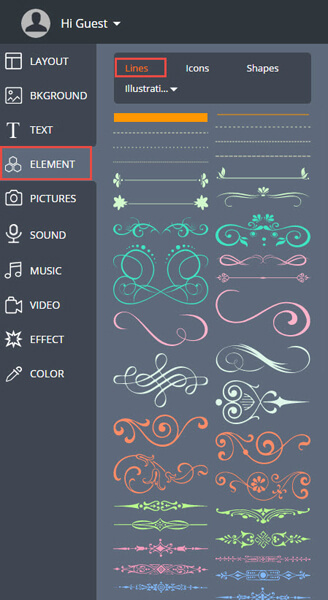 Choose from our library of professional graphic design elements such as lines, icons, shapes and more. 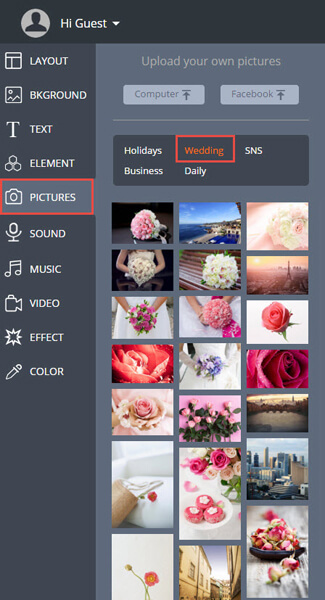 Of course, you can also fix your images with pictures and other effects, and add stunning filters with text. Then save and share. Change the images. Upload your own images or choose from our stock library of background, pictures, layout and effects. Change the fonts. Choose from over seventy fresh fonts. Share your happiness with your guests: add wedding photos to your card, or any of your favorite by uploading our dynamic pictures. Making your wedding invite vivid is as easy as dragging and dropping, and we’ll help you crop, filter, and process your pictures too! Your wedding invite made in AmoLink will become a memory that lasts a lifetime. 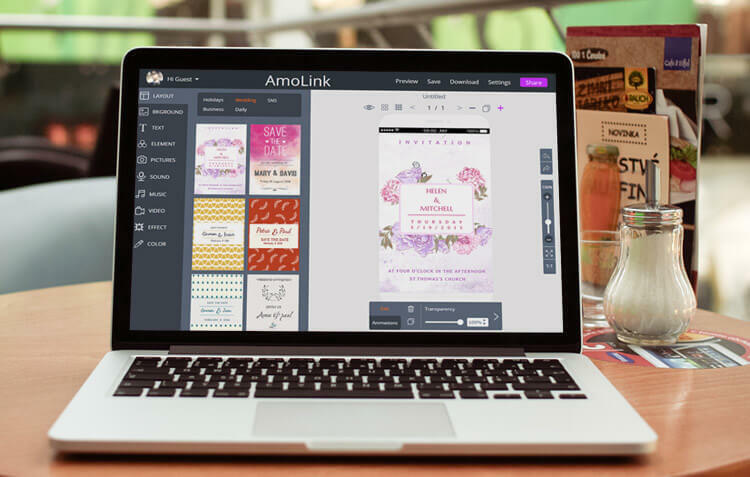 AmoLink makes creating beautiful and dynamic wedding invites simple, but sending them is even easier. Just click the top “save”, you can share your wedding invitation card either from social media sites or email. Putting customers’ need on priority, AmoLink believe that miracle stems from invention, we are trying our best to make a perfect product. More features will see you afterwards, stay tuned everyone! Hope you can not only have a fantastic design experience but also an attracting wedding ceremony!